If education is to play the role of equaliser across class segments and if learning has to be acquired by borrowing, institutions and regulations in the sector must be strengthened so that repayments are made correctly and on time, suggesting a mechanism to ensure this. 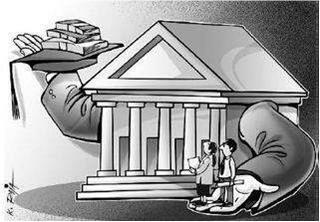 Some news reports suggest that the HRD Ministry is toying with the idea of being a guarantor for the educational loans provided by banks. There is also the possibility of creating a fund to sustain the guarantee and which may also be used for meeting NPAs that may arise out of these loans. The ostensible reason for this is that individuals have to provide collateral for loans that are more than Rs 4 lakh and, hence, the Government wants to step in, in socialistic fashion. The commercial banks are gearing to enhance the facilities for educational loans but, unfortunately, they are not adequately equipped to finance income-based lending activities compared to asset-based lending. For instance, such activities as trade, hotels and restaurants get similar treatment from commercial banks as the model for them is security- or asset-based lending and not lending based on anticipated cash-flows, because estimating risk premiums in the latter is more complex. Recently, most large commercial banks have increased their educational loan portfolio. The quantum and terms of loans vary from bank to bank. Currently, they lend up to a maximum of Rs 10 lakh for studying in India and up to Rs 20 lakh for studying abroad. It covers typically: tuition fees payable to college/school; examination /library /hostel charges; travel expenses; purchase of books /equipment /uniform; and cost of two-wheelers (optional). Repayment is in the form of equated monthly instalments (EMIs) and it generally commences one year after the course or six months after the graduate has got a job. The tenure can be from three years to eight years. Most banks do not require any margin up to Rs 4 lakh and, beyond that, some 5-15 per cent margins are charged. Similarly, collateral is not required for loans up to Rs 4 lakh; above this, collateral security is expected. The interest charged is that of Prime Lending Rate (PLR) or one percentage above the PLR. It is also to be noted that to encourage banks to lend more to the poor and needy students educational loans are brought under the ambit of priority sector. There is no separate data available on the quantum of non-performing assets in these educational loans. The experience of many of these banks with educational loans given in the 1980s is not much to write home about. Anecdotal evidence suggests that even students from prestigious engineering and management institutions have not repaid educational loans, though many of them are well-placed in jobs in India or abroad, some earning in millions. Tracking them is difficult in these days of job and city/country hopping among executives. As we are aware in India, often, the higher the social status of a person, the worse-off is his behaviour relating to public assets and loans. Political compulsions and other policy pressures will force banks to continue to lend and they may be saddled with a large level of NPAs, especially with respect to such loans. The defaults may not be due to the borrower’s inability to pay, but rather his unwillingness. The banks have to do tight-rope walking in meeting the educational loan requirements of all these classes and, at the same time, minimise risk associated with increased NPA in this sector as the higher the income of the person, the less he seems willing to play by the rules. It may be prudent to look at the whole issue afresh and create an appropriate sustainable model and re-engineer the entire educational sector as in the case of the housing sector. The Finance Ministry should create an Educational Funding or Finance Corporation, on the lines of the housing finance corporations. The said corporation can be co-founded by many leading financial institutions, with a corpus of at least Rs 1,000 crore. The institution should be equipped with people who have knowledge pertaining to educational institutions, courses, opportunities and job prospects. It should create a national register of educational institutions and the fees charged by them, including the facilities offered, and also compile a profile of current and past students. The loan sanctioned should be the first charge on the student’s salary, and the onus should be on the employer to deduct the EMIs and remit them to the bank. It should be similar to that of tax deduction at source. The employment application should mandatorily have a column to collect information regarding the loan status of the prospective employee. The employer can be any entity in the public or private sector, such as a company, co-perative, corporation or a partnership firm. The onus is on the employee to inform the employer about his loan position and it should be the responsibility of the employer to deduct the EMI from his pay and remit to the bank. The certificates issued by educational institutions should clearly indicate if the student is a loanee, as in the case of a hypothecated vehicle mentioned in the RC book. After repayment of the loan and discharge note to that effect, the educational institution can remove the stamp from his certificate. It is also required to have every passport stamped regarding the loan status of the person and if he has availed of an educational loan then immigration clearance should be mandatory and given only on clearing the loan. In the case of students not getting employed after availing of the loan, the Government can recruit them as outsourced temporary hands in the respective Departments / Ministries and deduct the EMIs from their monthly pay/stipend. No student should be denied education due to lack of resources and no bank should be denied its EMI due to lack of systems and a nonchalant attitude, particularly on the part of better-off sections. We might have to amend many laws and regulations (such as equating educational loan EMIs with TDS and stamping passports). But it is vital to look at the issue as one of enhancing opportunities available to all sections as education by definition equalises different classes in society. This should not be attempted by the Government using the socialistic paradigms of the 1960s by creating funds or by being the guarantor for loans. It will increase NPAs as it will be felt that the “Ma-Baap Sarkar” will take care of the repayment. This will send a wrong signal. If education is to continue to play the role of equaliser across class segments and if learning has to be acquired by borrowing, the only way out is to strengthen institutions, instruments and regulations in this sector so that the repayments are made correctly and promptly to the banks. Equally important is to make youngsters responsible for their actions and make them understand that they are role models for future generations. Hence, repayment of money borrowed for education is a social duty. Let us not try to pamper segments that are already pampered enough. they simply increased the number of instalment payable. they don’t even give any prepayment. can affort to play this kind of dirty game , because the loan is fully secured with assets of the borrower. the interest rate is revised upwards.